This skills program tells the rest of the story of backpacker Mike Bargetto and his three relatives, who were caught in an unexpected snow storm in October of 2004. The story describes their rescue from their Rae Lake camp site, in California's John Muir Wilderness. The rescue was lead by Leutenant Phil Caporale, of the Fresno County Sheriff's Search and Rescue unit. He and Mike tell the story of the rescue from both perspectives. Steve wraps up the show by talking about how you can be better prepared for unexpected mountain storms, and how to stay safe in such conditions. See the supplemental links, below, for lots of additional information. This skills program tells the story of backpacker Mike Bargetto and his three relatives, who were caught in an unexpected snow storm in October of 2004. The story describes their hike in California's John Muir Wilderness from Courtright Reservoir to Rae Lake, and the conditions they encountered there. In part two, we'll present the rest of Mike's story, and some advice for safely enjoying late season wilderness travel. This skills program is about the job of being a backcountry ranger in national forest wilderness. It's a frequently romanticized job with lots of responsibility. Three rangers talk candidly about their experiences. Sendi Kalcic and Brent Carpenter are professional backcountry wilderness rangers who have worked in the Desolation Wilderness of the Eldorado National Forest near Lake Tahoe, California. Amy McElvany is a volunteer wilderness ranger in the Sierra National Forest, working out of the High Sierra Ranger District. At the end of the show, there's a correction from last week's show, and a request to offer your feedback and suggestions for the show. This skills program presents the Leave No Trace skills for minimizing our impact on wilderness areas. 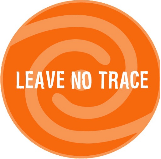 Steve interviews Ben Lawhon, the education director of the Leave No Trace Center for Outdoor Ethics. Ben quizzes Steve on his low-impact wilderness skills.